Noting that he’s never known Donald Trump to be racist in his personal interactions, Norm Macdonald suggests that the Republican presidential hopeful is “playing some sort of character,” and defends Jimmy Fallon’s interview with the controversial candidate. Norm Macdonald: Well Mr. Trump is a friend of yours. 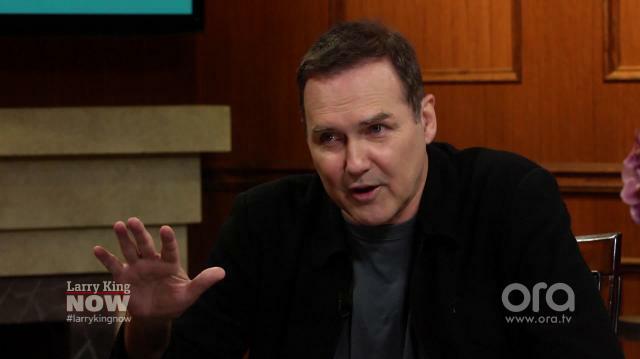 Norm Macdonald: I think you would… I know him casually. I’ve never seen from the man in my meetings with him any trace of racism. Norm Macdonald: Any trace of malice. Larry King: So what do you make of his campaign, which has traces of racism and traces of malice? Larry King: He’s got a part here. The part is he’s running for President. Norm Macdonald: Yes, exactly. And so I don’t know whether to be afraid or not, you know what I mean? You know, there have been in this country at times people like Huey Long or somebody like that came along that raised a little terror in people. But I think personally our democracy is bullet proof to any sort of, any chance of facism. And I don’t think Donald Trump even, is going that way. But if people are afraid of that, I think our democracy denies that. Larry King: You think he’s demagogic? That’s not a word, is it? Norm Macdonald: You go and you speak. Larry King: It’s the biggest high of all. Larry King: And they laugh. That’s… right? Larry King: There’s no bigger joy. So when he gets the applause, that’s enough? Norm Macdonald: I think that’s what he loves. I don’t know if he wants to be president. What I uh, I don’t think he’ll win, I think he will start a giant television network. Norm Macdonald: And Larry King, maybe. Larry King: The Trump Network. Norm Macdonald: The Trump Network. Larry King: And how about Norm Macdonald with comedy specials weekly? Norm Macdonald: I would be your apprentice on the Trump Network. Larry King: You recently said of Trump, by the way, “you’ve got to be able to apologize and you’ve got to be able to say you’re wrong. You have to have some humility. Why doesn’t he seem to have that? Norm Macdonald: I don’t know. Larry King: I know him and I don’t know. Larry King: Did you try to take a picture with him and he snubbed you? Norm Macdonald: Yeah well, it was kind of a funny thing. I was on the Jimmy Fallon show and I was watching, and he was the first guest and people you know, were the next day saying that Jimmy was too easy. You know as if Jimmy’s Douglas Edwards or something. You know he’s just a guy, you know. He’s just a kid who loves everybody. So he’s not going to, he may have lost his chance to moderate ‘Meet the Press’ but I don’t think that was ever his goal. But yeah so Donald came, it was only a couple minutes between when one guest leaves and the other comes in, so I was in the hall with him, he was with his secret service. And he knows me, you know. So I said, “Donald, a picture.” So he said, “I love this guy,” he’s talking to his secret service guys. So he goes, “I love this guy. I’ll take a picture. Just one minute,” and he turned around, and then he walked to the elevator and got on it. So uh, you know I did make a few comments about him and I haven’t spoken to him since then and I always wonder, “oh gosh, I hope he didn’t read those comments and uh…” Like his humility, you know. Cause I do think that humility is a huge, important thing for a person to have, you know. Maybe one of the most important. Larry King: Oh everybody will be humble sometime. Norm Macdonald: Someday, oh absolutely. You’re right about that. Larry King: You’re not a big fan of Hillary’s, are you? Norm Macdonald: No, I don’t like her either. Larry King: Why don’t you like Hillary? Norm Macdonald: I don’t like her in any way. Well, because I think she’s the most corrupt person that we’ve ever had in the White House. I mean, there’s so many terrible things that she’s done that we forget. But there was one that, I don’t know why this was swept under the rug but you know, she went into the IRS and looked at political enemies’ tax returns. Larry King: Nixon did that. Norm Macdonald: Yeah well, absolutely Nixon did that, yeah. She’s a Nixonian figure. Larry King: You know that Hillary did that? Norm Macdonald: Well as much as I know anything. I mean, it was, this was reported. And it was a, it was a, thing for a very short time. Cause the news cycle goes so quickly. And maybe nowadays you know Nixon, Watergate, they would’ve just been aFridaynight story that would’ve disappearedon Monday.